*** NEW: Version 3.0. Revised & updated as of Jan 2014. 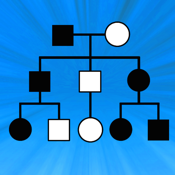 *** Genetics & Syndromes made easy for medical students, nurses and doctors! 3. Pictures of chromosomal location of a condition. 4. Basic concepts of Medical Genetics simplified. 5. NEW in Version 2.0: Links to external online resources. 6. NEW in Version 2.1: New section added- GENE TEASERS. Genetic conditions are seen in almost all Medical specialities. Medical Genetics is one of the fastest developing branches in Medicine. Genetics 4 Medics application has been designed by a group of doctors, to be used as an educational tool by medics and other healthcare professionals interested in Medical Genetics. We hope that this app will make learning Medical Genetics, easy and exciting for both students and practising clinicians alike. This app has four sections. - Links to external online resources provided for majority of conditions described. - We have mainly included conditions caused by single gene defect. However, a few conditions with genetic heterogeneity have also been included. - Pictorial representation of chromosomes to facilitate visual learning and memory. Note: these pictures do not represent the exact banding pattern of a chromosome and are not drawn to scale. - Tapping on the titles will open up the description page of the condition. - Selecting a clue provides links to the conditions commonly associated with it. Food for your genes! Try out these questions in your spare time. This section will be updated regularly with new questions. These questions are case based scenarios and based on common Genetic conditions seen in clinical practice. A notification will appear on the app icon whenever this section is updated with a new question. The title of the case scenario will automatically be updated in this section. The user will be able to download the case by selecting the download icon next to the title. NOTE: An active internet connection will be needed for the regular updates as well as to download the cases. Genetics 4 Medics application should only be used for educational purposes and NOT as a diagnostic tool. For help with diagnosing a genetic condition, please take advice from an experienced Clinical Geneticist. Full Terms & Conditions available on downloading the app. Users must agree to these Terms & Conditions prior to use.